Have you tried poaching fish? It’s a wonderful way to retain the integrity of the protein and keep the omega 3 fats heart healthy by NOT frying them in vegetable oil. Plus, if you add into the poaching liquid, culinary herbs like rosemary and thyme, you pump up the flavor and boost the health benefits as those herbs release their own essential oils into the liquid. In the recipe below, I added mirin, that is a sweet rice cooking wine used in Japanese cooking. But, you can use other types of white wine. Or, you can omit the wine entirely. 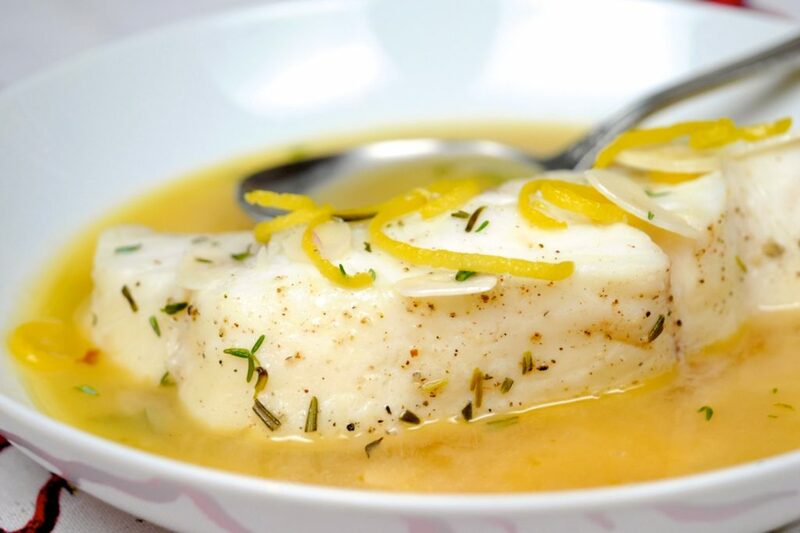 I used halibut in this recipe, but it can be quite expensive – sometimes up to $36 per pound! To help save some dough, and still whip up a great tasting meal, you can use any other kind of fish that you enjoy (and that won’t break the bank! ); fluke, sole, flounder, salmon, hake, cod, scrod, sea bass, etc. If you are using smaller and thinner fish (like fluke, flounder and sole), you would reduce the poaching time to 2-3 minutes. Here’s the recipe. It’s quick and easy, and totally delish! 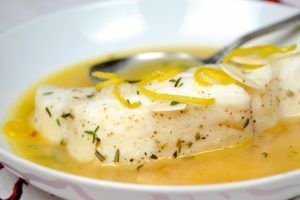 Poached fish with aromatic herbs is a GREAT way to maintain the integrity of the fish without damaging it's healthy oils. Put mirin, water, shallot, bay leaf, thyme, rosemary and peppercorns into an 8-inch frying pan and bring to a boil. Add the fish pieces into the pan, cover, and lower the heat to simmer. Poach 4-5 minutes depending on the thickness of the fish. Remove the fish from the liquid, and set aside in four separate bowls. Add the butter, lemon juice and garlic into the pan and cook one minute. Spoon liquid on top of fish.